The Happenin' Habber stands next to her newest Space Marine friend. 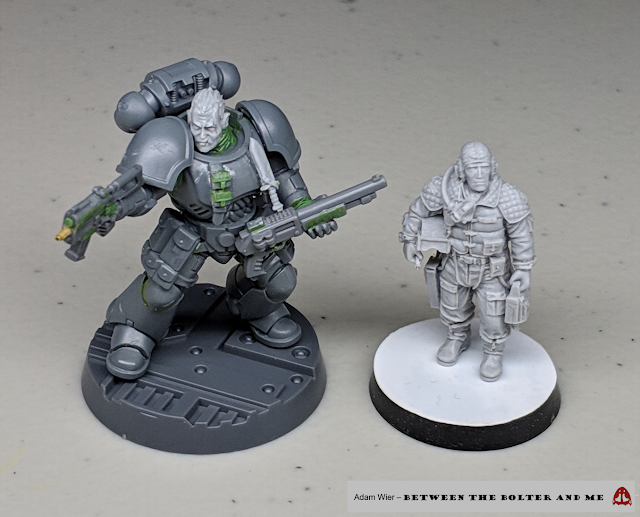 For the second installment of Conversion Corner, I decided to focus my attention on converting a Space Marine operative. I have been exploring the design for Space Marine weapons, namely the bolter (True-Scale Marine, Elder One Othalanga; Primaris Marine) for a while now. 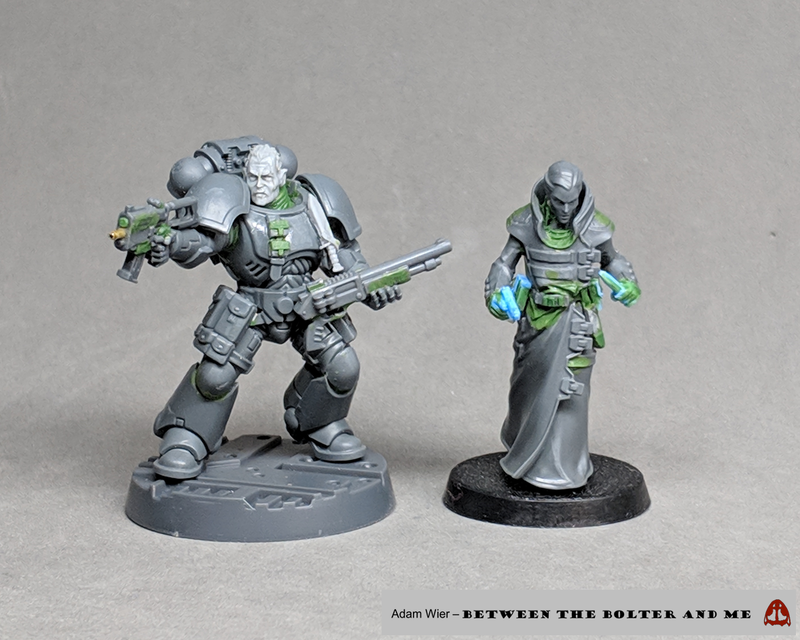 For this marine I wanted to delve even further into creating a sub-machine gun (SMG) variant of the bolter (and challenge the commonly perceived size of such a weapon). Additionally, I wanted to experiment with equipping a marine with one of the Genestealer cultist shotguns. Since their release, I always thought they would work perfectly on Space Marines, particularly the Primaris-scaled Marines. The genestealer cultist shotguns are far better scaled to Space Marines than the plastic Deathwatch ones. I based the SMG bolter off of the newly released Delaque flechette pistol. While much too large for a human-sized pistol, the weapon makes a convincing SMG for a Space Marine. To transform the weapon into a bolter, I shifted the weapon’s magazine back closer to the pistol grip, allowing room for a forward grip by the operator. Additionally, I trimmed off the toxin chamber (?) on the side of the weapon and filled the flechette ejection port. Finally, I added a rear sight to the weapon and replaced the barrel with a smaller one made from brass tubing (Albion Alloy). Replacing the barrel with brass tubing gave me much more control of the bore size of the barrel. 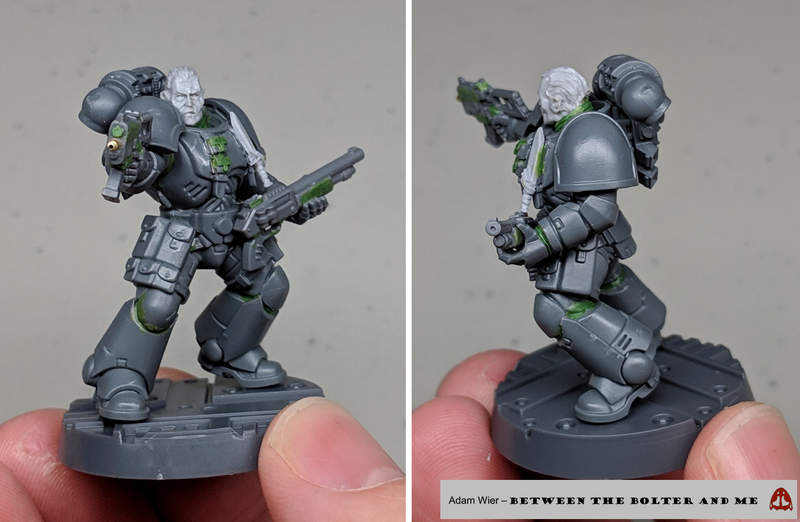 While the barrel is much thinner than normally seen in bolter weapons, it would still allow for .50 caliber or larger rounds commonly associated with bolters. The bolter was converted from the flechette pistol from the plastic Delaque Necromunda gang. Brass tubing is fantastic for creating gun barrels, and less fiddly to work with than plastic when working with something so small. Conversion work on the Space Marine himself was pretty minimal, with most of it focused on the Marine’s legs. I used a Space Marine Primaris Reiver body and legs, replacing the shins and feet with those of a Primaris Intercessor. I decided to do this because the Reivers’ legs have a lot of nice webbing and ammunition pouches attached directly to the legs, alleviating the need to add them yourself, which would necessitate a lot of green stuff work. By cutting off the lower half of the Reiver legs, you also remove the awkward looking “high-top” design of their feet which many people disliked when they were first revealed. His head came from the Forge World model of Sevatar, First Captain of the Night Lords. To hold one of the Genestealer cultist shotguns, I carefully carved the bolt rifle from a Space Marine Intercessor arm/hand. 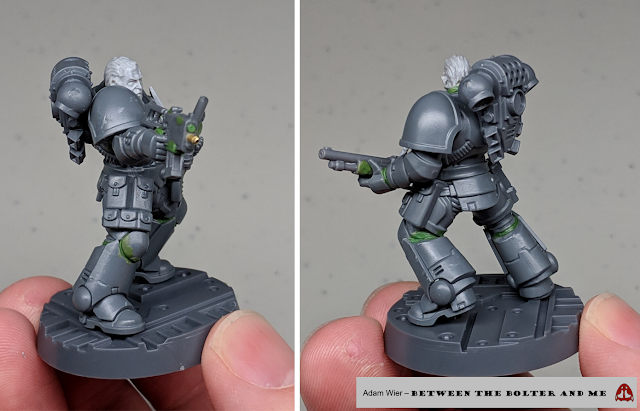 This allowed for a much more convincing grip on the weapon, compared to the “open” hands some Space Marine models have that often leave a lot of space between the weapon and the fingers. 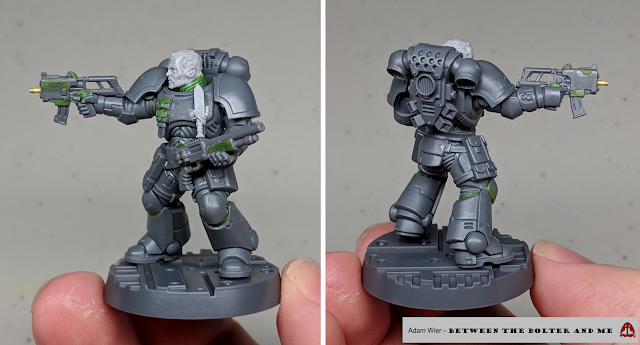 The legs were spliced together from the upper part of a Primaris Reiver and the lower part of a Primaris Intercessor. The Space Marine next to an Imperial Pilot from Forge World. 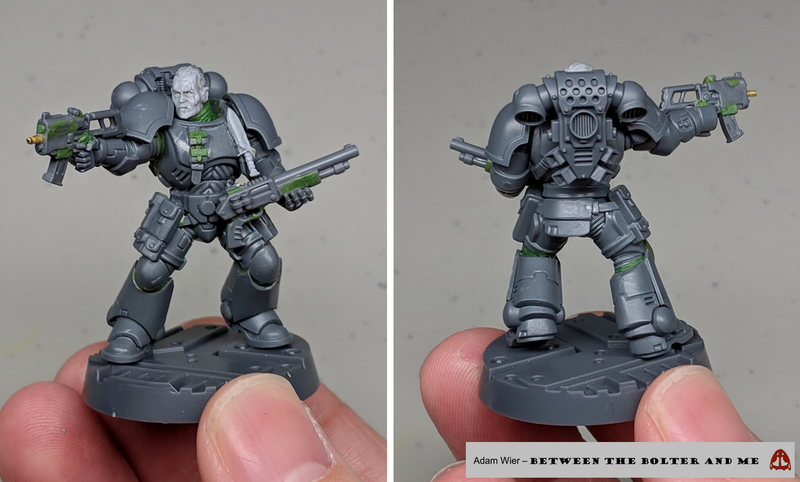 I am quite happy with how this Space Marine turned out; it proved my suspicion that Genestealer cultist shotguns are scaled quite well for Space Marines and that the Intercessor and Reivers models mesh together well for creating true-scale Space Marines. As always, it was fun experimenting with converting different patterns of boltguns. The model was fun to build, so maybe I will make some more in the future. Let me know if there are any sorts of Space Marines you would like to see! Great conversion. Personally I like the giant 'ammo the size of a drinks can' bolters. It is easy to argue that bringing practicality and believably to Warhammer 40k is a folly. I like to think it adds another layer of seriousness and helps create an even more bleak setting (something very fitting for the universe!). The background for bolters in general is really all over the place. Often times the background suggests the round are around .5 to .75 caliber (both huge for a modern day rifle). Both of those calibers are still significantly smaller than the diameter of a soda can. The sculpted magazines on most bolters are even large enough to hold soda can sized rounds. And even if they are large enough, they could only be a single stack magazine. So each magazine would hold around 10 rounds, not something very practical for an assault rifle. As for caliber, there would be little point to Space Marine Armour if it didn't allow one to fire at least the equivalent of a Browning M2 (.5) or something bigger like a KPV as a normal person would fire an Uzi or an MP5. Maybe a heavy bolter would be more like a Bofors gun or similar, which makes it ridiculous that Guardsmen and women would use it as a standard squad machine gun, but 40K has always been ridiculous by reason of standardising (for want of a better word) weapons across the range (the worst example being tanks which are armed with nothing more than lascannons or autocannons when these are weapons that are so light they can be carried by infantry, one man for Space Marines, or a 2 person team for humans). It's not a critique Adam, I love your conversions (always have) but I like the silly big weapons. If your going for realism then you are spot on. That sub-machine gun is great, and it would even work as a heavy caliber weapon for a normal human. The Reiver torso is a good choice too for a "lighter" mark of armor. The Reiver torsos and legs are great for creating 'lighter' armor marks. Their trimmed down shoulder guards are cool too. You could argue the cutouts in them would allow the operator to shoulder a weapon. Fantastic conversion! The pose and attention to detail are quite wonderful, as usual. The shotgun is a little simple, but then again the space marine ones are not really much better. The Deathwatch shotgun is even a pump action shotgun. In the future I would like to actually convert a suitable space marine shotgun. It will be a good challenge! Great conversion, the Reiver parts work really well with the Intercessor elements making a very pleasing overall model. The weapons look great and he looks sort of like an action hero, brandishing an odd assortment of disparate weapons in a desperate situation! I really like the SMG conversion. The marine certainly does have an action hero vibe to it! He really reminds me of a marine from the cover of the 2nd edition of Warhammer 40,000. Absolutely stunning, as always - Great stuff, man! Apparently my comment didn’t take 🤨. This model turned out excellent especially considering the fraction of the time you normally spend on a miniature. I think both weapons are excellent choices. The smg is the first take I’ve seen on a Bolter smg. The shotgun while simplistic seems like a great choice for an operative such as this. There really are few thing as reliable, simplistic, and versatile as a pump action shotgun. I’m sure you all already had that thought when making the model though. I had been musing about a submachine gun variant of a bolter for a while. The release of the Delaque flechette pistol seemed like the perfect opportunity to make it a reality! The shotgun has been a humble defender of the Imperium since its formation! I really should paint the model. I have my doubts it will actually happen though. 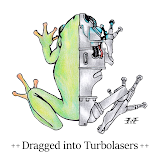 So many other projects sapping away my time! That's a cool model! I like seeing your experiments with the gun sizes. Very unique approach! This is a standout conversion , the scae is perfect and i can relate to the difficulty in carving out the gun from his hand. . Thank you again for this wonderful gift. He will make a fine addition to the scouts and gaurdsmen .